Jesus told [Martha], "I am the resurrection and the life. Anyone who believes in me will live, even after dying. Everyone who lives in me and believes in me will never ever die. Do you believe this, Martha?" You will never perish! Did you catch that promise embedded in Jesus' words? Jesus says: 1) Lazarus will be raised (right then); 2) those whose bodies die will be raised to live again; and 3) those who believe in him will never die! We readily accept the first two, but most of us have never really grasped the third one. However, Paul tells us in Romans 6 that when we are baptized, we share in Jesus' death and die to sin. That means we've died the only death that truly matters because now we are alive to God in Christ Jesus. My life (your life) and his life are fused. His future is our future. His glory will be our glory. His resurrection is our resurrection. Do you believe this? If you do, then nothing is ever the same again! 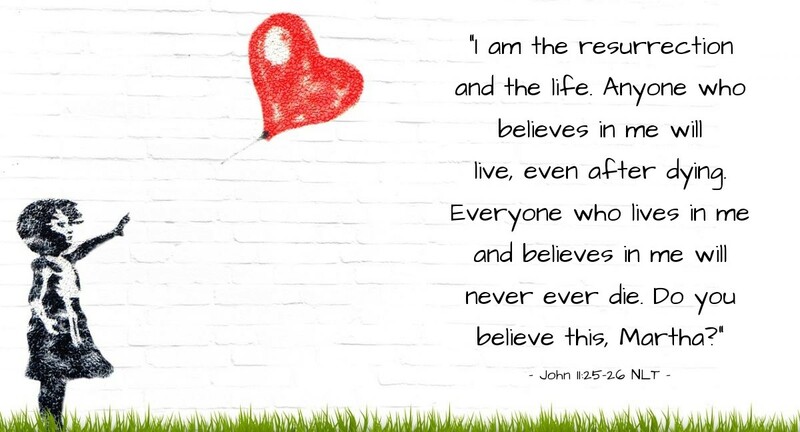 Glorious God, my Abba Father, I ask for help to believe more strongly in the words of Jesus. I want to live vibrantly, always alive to the promise that the true life that is me is tied to Jesus and that Satan cannot defeat, destroy, or take that life from my Lord. Stir me to live more passionately, always alive to the moment knowing that my future with you is secure. In Jesus' name, I pray. Amen.